Last week, Jami Noguchi posted a brief bit about Cowboys & Aliens, The Smurfs, Captain America and Harry Potter. He brought up an rather frequent complaint from movie fans: That Hollywood prefers to remake old movies or adapt movies from other media formats (novels, tv shows, comic books, etc). And I think pretty much everyone understands why. Generally, it’s easier to adapt something than write something new and good, and something with a proven track record in another medium is probably going to have a better chance at doing well financially. For the last 10 years, 28 of the 100 highest grossing films were original screenplays. Of the other 72, all but 16 were reboots or sequels or later in film franchise. I’m going to expand that a bit here, and take it a bit farther back in time if I can. So let me define my categories. First, “Original”. Pretty simple. Original screenplays that aren’t directly adapted from other sources. Second, “Remake”. Again, simple. Screenplays which are revisionings of earlier movies. Third, “Franchise”. These are films which are sequels/prequels or later in a series of movies. Fourth, “Adaptation”. Movies which are adapted from other forms of media. So, for a bit more clarification, if a movie is the first of a series of books, then it counts as an adaptation, such as the first Harry Potter, Twilight and Lord of the Rings movies. If a movie is a reboot of a franchise, such as Batman Begins, then it counts as a remake. The movies that follow a reboot (The Dark Knight and The Dark Knight Rises) are counted as franchise films. A movie that is a loose revisioning of a fairy tale is an adaptation (think Tangled -> Rapunzel), but a movie that plays on cultural memes, like 2012, but isn’t directly adapted from a book (despite there being books about the 2012 prophecy) is an original screenplay. A few movies have complicated ancestry, so I will document how I counted them here. I tallied up the numbers for every year 1981-2010, and the results are pretty clear. As you can see, from 1981-1990, only a single movie of the top 10 yearly grossing movies was a remake of an earlier movie. 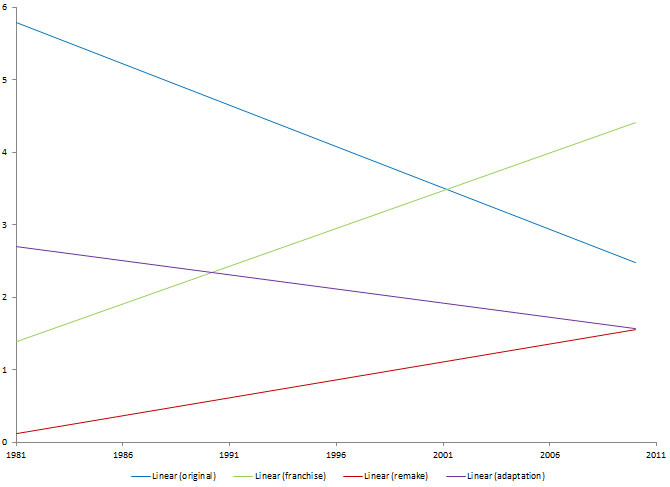 And from 2001-2010, franchise movies have dominated the top grossing charts. But that doesn’t really clearly indicate any trends. 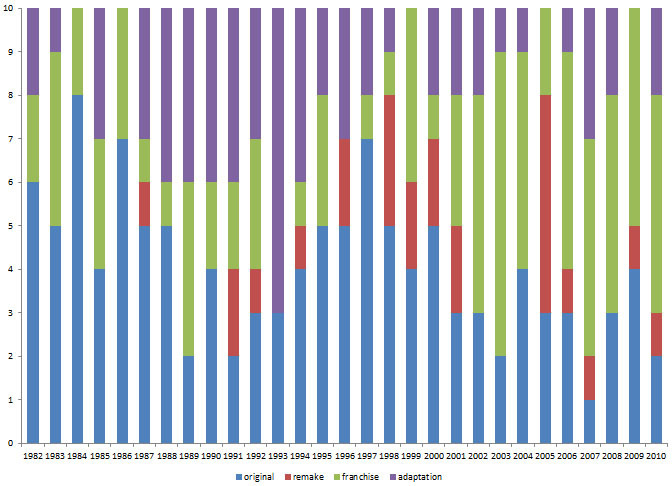 The numbers of remakes and direct adaptations have slight changes, but have for the most part stayed the same. But franchises have skyrocketed and original movies have taken a nose-dive. Of course, it’s important to remember that this doesn’t give the full picture of the movie industry as a whole. Without looking at the full yearly releases, we can’t really draw any solid conclusions. We’d have just as much reason to assume the rest of the top 20 movies are all remakes as we would to assume they are all original screenplays (neither of which is particularly likely). Also, if you split things differently — say counting original screenplays against adaptations (both new and franchised) against remakes — or counted as adaptations the remakes of movies where the original movies were adaptations, you might have a rather different count. At some point I might actually take the time to do all of that and more. are from? i promise to qoute you, i’d like to use your views in a school report. thanks. I created the charts myself.